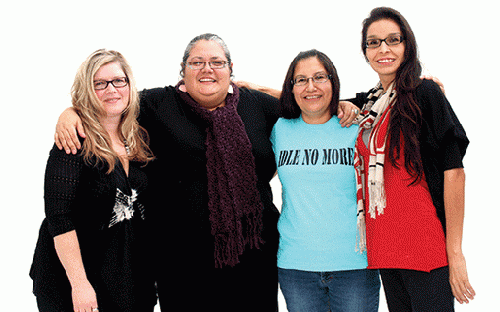 When a new law paved the way for tar sands pipelines and other fossil fuel development on native lands, four women swore to be "idle no more." The idea took off. McLean: I have visions of tackling inequality; we're one of the richest countries in the world off indigenous lands and resources, and yet they are some of the poorest communities. And I'd like to see sustainable communities. What's beautiful is that sustainable energy and technologies are absolutely in line with everything that Sylvia talks about in terms of indigenous laws on how to live with the land. McAdam: It's absolutely that, yeah. For me it's also self-determination for my people. And I would like that young people no longer utilize suicide as an option. McLean: We're starting to connect to the global community, to the United Nations, to solidarity groups around the world. Indigenous peoples worldwide are facing these same issues of having their land taken away, their resources extracted, and their land and water poisoned. As more and more people come on board, it will take the shape that it needs to take. Each community has to decide how they're going to tackle the issues of sovereignty and rethinking what it means to live with the land and water. It is going to continue to grow, there's no doubt about that. And it will take various forms of resistance and building.